Routines from a full-time pro that you can (and will) do! 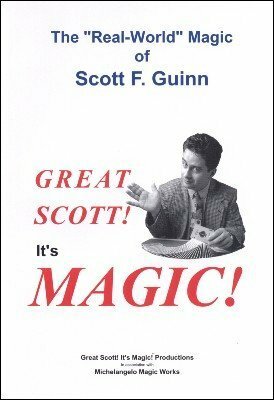 Scott F. Guinn is a full-time professional magician from Star, Idaho (near Boise) who has been entertaining and amazing audiences throughout the US and Canada since 1978. Scott earns his living performing for "real people" in the "real world". Scott has also written several books and ebooks which you can find here at Lybrary.com. He was featured in publications such as The Linking Ring , MUM , and AM/PM . On this DVD, you will find material from Scott's "A List", the stuff he performs for real people in real-world paying gigs. The routines that make his audiences exclaim, "Great Scott! It's Magic!" Red Hot Mama's Lips : Red Hot Mama with a charming theme and a killer kicker! Peanut, Butter & Jelly : Scott's favorite effect. Many have called this the best sponge ball routine out there! Magic Western Union:Larry Jennings exclaimed that this was the best presentation for "Flying Eagles" he'd ever seen! What the ...? Super easy effect inspired by Marlo's "Devilish Miracle". Treasure Valley Twist : Yes, it's a "twisting" routine - but just wait until you see it! BONUS: Great Scott's Ring and Rope Routine .